In response to the high levels of mental health needs and the challenge of limited resources, Athol Hospital, located in Athol, Massachusetts, partnered with the Athol-Royalston Regional School District (ARRSD), the Northeast Telehealth Resource Center (NETRC) and Clinical & Support Options (CSO) to develop a collaborative school-based telepsychiatry model focused on bridging care gaps for children and families residing in the Athol Hospital and ARRSD service area. The Athol School-Based Telepsychiatry program is an excellent example of how innovative approaches can effectively stretch limited resources across rural communities to increase access and improve outcomes. 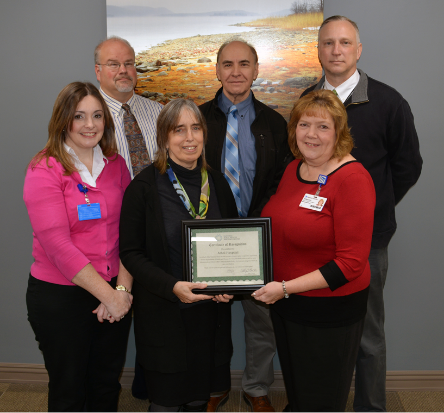 In accepting the award, Rebecca Bialecki, Vice President of Community Health at Heywood Healthcare, Athol Hospital’s parent organization, stated, “The development of the telehealth network has truly strengthened the partnership between our schools and our community mental health."